The United Nations claims it is doing its best to curb widespread sexual abuses in its peacekeeping operations overseas – from Haiti all the way to the Central African Republic. It was two a.m. on Aug. 2 as peacekeeping forces from the U.N. Multidimensional Integrated Stabilization Mission in the Central African Republic (MINUSCA) searched for a criminal suspect in the PK5 Muslim enclave of the capital city of Bangui. The United Nations, which came under heavy fire for its failure to act swiftly on charges of sexual abuse by French troops in the Central African Republic (CAR) last year, has decided to set up an External Independent Review (EIR) to probe these allegations. Leaked United Nations documents show high-level staff knew of abuses by soldiers in the Central African Republic and failed to act, all while planning the removal of U.N. whistleblower Anders Kompass. As the U.N. enters its 70th year, it is legitimate to ask whether it has been a success so far. Over the years, the media, in particular the Western media, has tended to highlight the U.N.'s failures. A rising tide of sexual abuse in U.N. peacekeeping operations has triggered the launch of a high-level campaign to end the continued attacks on women and children and an urgent call for the creation of an independent commission of inquiry. An internal United Nations expert report released Monday by the non-governmental organisation AIDS-Free World reveals serious contradictions in the U.N.’s reporting of sexual exploitation and abuse by U.N. peacekeepers. Finding ways to better integrate the two arms of U.N. Peace Operations - Special Political Missions and Peacekeeping Operations - will be one of the priorities for a new review panel headed by Nobel Peace Laureate and former president of Timor-Leste José Ramos-Horta. After a week that saw a massacre inside a U.N. base and wide-scale ethnic-based slaughter in an oil-producing region, the international community is grappling with what, if any, options remain to save lives in South Sudan. Amid alarming reports of ethnic cleansing in the Central African Republic, the U.N. Security Council voted unanimously Thursday to send an official peacekeeping mission to the conflict-torn country where the minority Muslim population has all but disappeared in much its Western half. Budget constraints in Washington and obstinacy at the highest levels of the African Union (AU) have combined to dangerously delay a possible U.N. peacekeeping mission in the Central African Republic (CAR), according to sources close to negotiations currently underway in New York. There are growing concerns that the massive funding crisis for peacekeeping operations in the Central African Republic (CAR) will jeopardise any prospect of restoring stability to the country. Reports of horrific revenge killing continued to emerge from the Central African Republic Wednesday, less than 24 hours after the Security Council voted to increase the international troop presence there and levy sanctions against those it suspects of war crimes. On Jan. 11, 1994, Romeo Dallaire, force commander of the United Nations Mission in Rwanda, sent a fax to U.N. Headquarters in New York, telling officials there a source close to the government had confided to him that Tutsis were being forced to register themselves in Kigali. As the death toll rises from South Sudan’s spiraling political and ethnic conflict, the ability of the U.N. to enforce its peacekeeping mandate in the country is coming under increased scrutiny. “We couldn’t stand the violence anymore,” said 27-year-old Baba Hamadou shortly after alighting from a chartered flight at the Douala International Airport earlier this week. 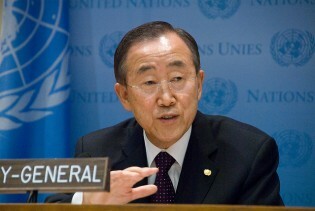 As the ongoing crises in some of the world's hot spots - including Syria, the Central African Republic, Mali, Libya, Palestine and Darfur, Sudan - continue unabated, Secretary-General Ban Ki-moon Monday singled out some of the biggest challenges facing the international community in 2014. France has said it will circulate a Security Council draft resolution Monday night that would create a U.N. peacekeeping force in the Central African Republic, as violence in its former colony threatens to morph into an ethnic conflict. As U.N. peacekeeping operations assume a more agressive role in conflict zones, the first concrete results came last week when the armed forces of the Democratic Republic of Congo (DRC) defeated the M23 rebel group after a 20-month-long insurgency. Amidst a rise in sexual violence in the world’s war zones, the United Nations has begun appointing women to head some of the key political and peacekeeping missions in conflict areas - and also created Gender Advisers as a second line of defence.